Some work of noble note, may yet be done, Not unbecoming men that strove with Gods. The lights begin to twinkle from the rocks: The long day wanes: the slow moon climbs: the deep Moans round with many voices. Come, my friends, ‘Tis not too late to seek a newer world. Push off, and sitting well in order smite The sounding furrows; for my purpose holds To sail beyond the sunset, and the baths Of all the western stars, until I die. It may be that the gulfs will wash us down: It may be we shall touch the Happy Isles, And see the great Achilles, whom we knew. Though much is taken, much abides; and though We are not now that strength which in old days Moved earth and heaven; that which we are, we are; One equal temper of heroic hearts, Made weak by time and fate, but strong in will To strive, to seek, to find, and not to yield. 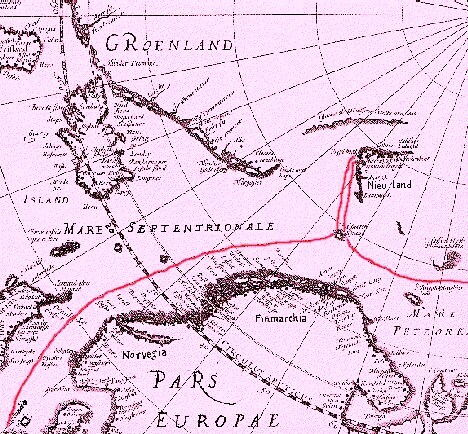 A map of the supposed route of Henry Hudson's final voyage - no one knows the true track - which may have been made to survey Hudson Bay rather than to find the Northwest Passage. 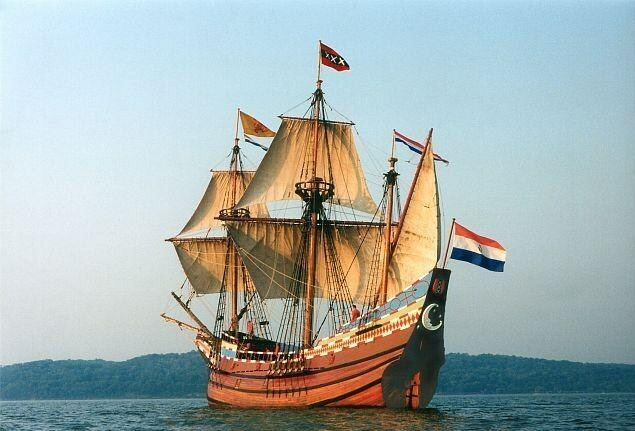 Henry Hudson's ship Half Moon. The Discovery, from which he was set adrift, was smaller - about 38 feet long and displacing only 20 tons - and had been built in the late 16th century. She had been the smallest of the three ships used for the expedition to and founding of the Jamestown, Virginia colony in 1607. Despite having been locked in the ice in 1611 her remaining crew of 8 - who were never tried for mutiny - sailed her back to London. The English explorer Henry Hudson devoted his life to the search for a water route through America, becoming the first European to navigate the Hudson River in the process. In Fatal Journey, historian Peter C. Mancall narrates Hudson’s final expedition. In the winter of 1610, after navigating dangerous fields of icebergs near the northern tip of Labrador, Hudson’s small ship became trapped in winter ice. Provisions grew scarce and tensions mounted amongst the crew. Within months, the men mutinied, forcing Hudson, his teenage son, and seven other men into a skiff, which they left floating in the Hudson Bay. A story of exploration, desperation, and icebound tragedy, Fatal Journey vividly chronicles the undoing of the great explorer, not by an angry ocean, but at the hands of his own men. 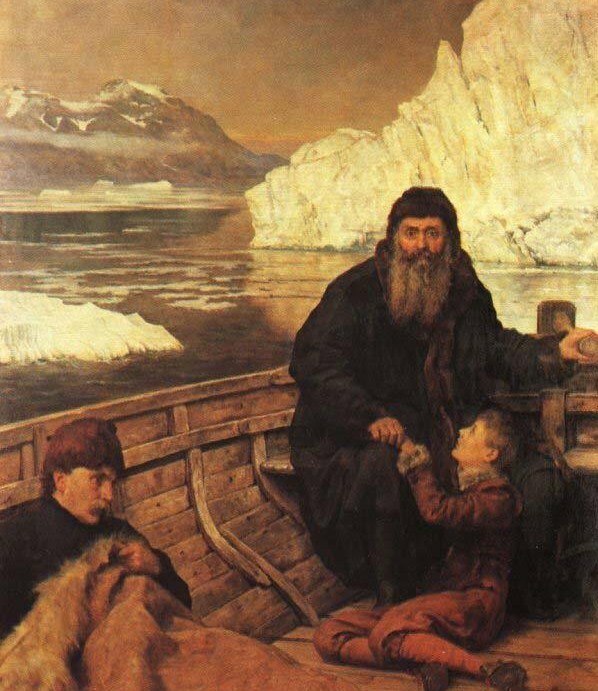 John Collier's fanciful portrait of Hudson adrift with his teenage son and loyal crew members - no trace was ever found - of the famous English navigator who sailed for the Dutch. It is interesting to realize that the famous Italian navigator who sailed for the Spanish - Christopher Columbus - nearly met a similar fate when his first voyage took too long to find land. The hold on command by the master of a vessel could be a tenuous thing in the age of discovery. Comments Off on Some work of noble note, may yet be done, Not unbecoming men that strove with Gods. The lights begin to twinkle from the rocks: The long day wanes: the slow moon climbs: the deep Moans round with many voices. Come, my friends, ‘Tis not too late to seek a newer world. Push off, and sitting well in order smite The sounding furrows; for my purpose holds To sail beyond the sunset, and the baths Of all the western stars, until I die. It may be that the gulfs will wash us down: It may be we shall touch the Happy Isles, And see the great Achilles, whom we knew. Though much is taken, much abides; and though We are not now that strength which in old days Moved earth and heaven; that which we are, we are; One equal temper of heroic hearts, Made weak by time and fate, but strong in will To strive, to seek, to find, and not to yield.